So you think you’ll walk away from the sale of your home with a fat check? Yes, but it’s probably not going to be as fat as you think once the costs of the sale are deducted or counted against the amount written. 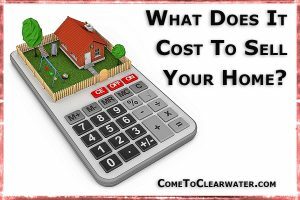 Knowing what the cost to sell your home is and how it will impact your final bottom line can also give you the information you need to lower those costs where you can. Before you list you’ll have to spend money to get it ready to sell. Spend on things like paint, cleaning supplies and storage for all your extra stuff after you declutter the home. These expenses don’t have to be high, but if you are advised by your Realtor that you should do some updates to kitchens and/or baths, those expenses could rise into the tens of thousands of dollars. Once it’s listed, there are other expenses that you may not expect. Do you have a pet? That could be a problem for people looking at your home. If it’s a cat or dog you may have to kennel them or pay a pet sitter to take them from the house for showings, or for the time it takes to sell. And when you have to be away for showings, remember that unless you have other errands to run, eating out is often the choice. Realtor’s commission: Your agent charges a commission in the form of a percentage of the sale price. This commission percentage is usually 6%, could be lower, could be higher, but let’s say you sell for $250,000.00 a 6% commission will cost you $15,000.00. Transfer taxes: The state, county and/or municipality will charge taxes or “stamps” for the transfer of the property. Depending on how many charge it, it can range from 0.01% to 2% of the sales price. And don’t forget that if you’ve sold a property before and realized a profit on it you’ll owe the federal and state tax authorities money on for capital gains taxes. Those will be due at tax time, but be sure to provision for it. Don’t forget your mortgage payoff and moving costs!